The 2016 Academic Board forum focused on innovation, both inside and outside the university. 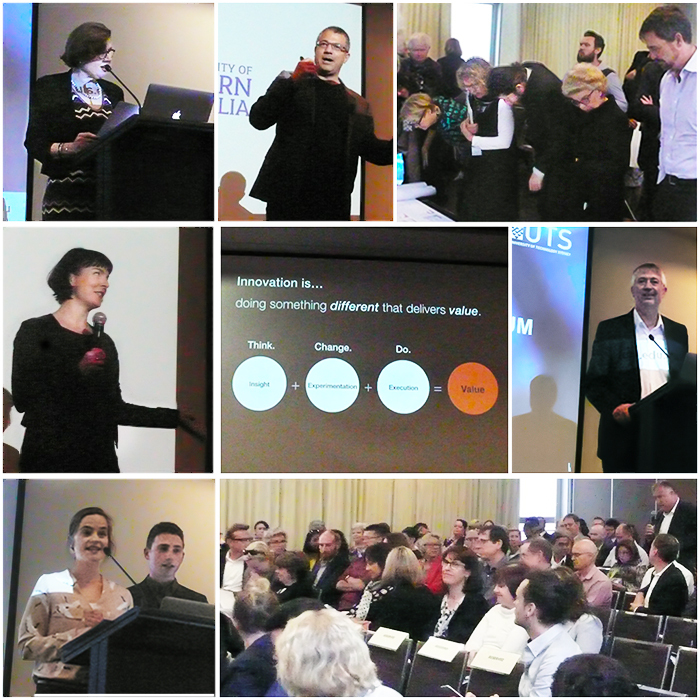 UTS and external speakers looked at innovation, transdisciplinarity and how our students are engaging with industry to innovate. Professor Peter Booth gave an overview of the UTS innovation strategy. Opher Yom-Tov gave the keynote presentation, Innovators: born or made?, describing his journey from working in Silicon Valley through to his role in the startup, Airshr. Opher challenged us to consider our own definitions of innovation and shared his: 'innovation is doing something different that adds value'. Professor Charles Walker then took us on an historical journey reflecting on how change, innovation and disruption have shaped society for centuries. Presentations from the Hatchery provided insight into the activities occurring in this innovative UTS space. We also heard from students in the Master of Data Science and Innovation (MDSI) and Bachelor of Creative Intelligence and Innovation (BCII), who described projects they've participated in and how relevant they were to their learning and current and future work. Innovation as a 'white knuckle ride': engaging with industry to innovate in the Master of Data Science and Innovation — Kelly Tall, Tracy Keys and Pedro Fernandez de Mendonca, MDSI students. Introduced by Dr Theresa Anderson, course director, MDSI. The governor's diary: student and staff transdisciplinary interaction — Tommaso Armstrong and Katie Wearne, BCII students. Introduced by Associate Professor Louise McWhinnie, head of department, Creative Intelligence and Innovation, and Dr Paul Brown, senior lecturer (accounting), UTS Business School and subject coordinator, BCII. A Q&A session followed each presentation, providing an opportunity to engage with the guest speakers.